Blokish - Totally addictive Android port of the strategy puzzle board game Blokus. Verdict: 3/5 A few additional features and a tweak to the slightly clunky control mechanism prevented it from getting a higher rating. Blokish – Totally addictive Android port of the strategy puzzle board game Blokus. Even with the great range of cool, colourful, cute games available on Google Play it’s always nice to return to simple classic gameplay every now and again. Blokish is the android port of the strategy board game Blokus, making a debut in 2000, making it a new board game in relative terms. I first found out about this game first on the iPhone, liked it a lot and decided to find the android version of it. 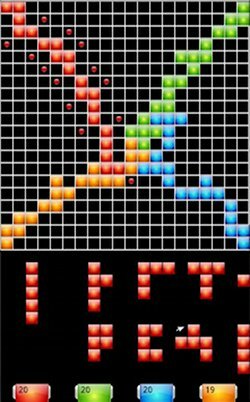 Gameplay: The aim of the game is to lay down as many tiles on the 20 by 20 board as possible. There are four players who takes it in turns to place their tiles on the empty board. Each player starts off with 21 different tiles, 12 five block tiles, 5 four block, 2 three block, 1 two block and 1 one block tiles. The first piece must start from the player’s own corner and any subsequent tile must be placed so that it touches at least one piece of the same colour, with only corner to corner contact allowed between the pieces. When a player cannot place any more tiles, they need to pass all future turns and play continues as normal for other players. The game ends when all players cannot place any more tiles. The winner is the player who has the most number blocks on the board. It takes a little time to understand the dynamics of game however once you do, the game is greatly rewarding as you try to always be one step ahead of your opponents. The game can get challenging if the computer players decide to gang up on you and block your path to laying down tiles. Blokish comes with four difficulty settings ranging from newbie level 1 to insanely difficult level 4. You also have the option to enable or disable the artificial intelligence of the computer players, however I didn’t find much difference in reality. To make things a little more challenging you also have the option to disable markers that tell you where your available moves are. Unfortunately this version of Blokus is not as fully featured as the iPhone version. It’s lacking the different challenges where you need to obtain a certain number of blocks or prevent your opponent from obtaining a number of blocks. In addition to this, it would be nice if you could be a different colour so you don’t have to always play first. Verdict: 3/5 Blokish is pure addictive and fun. A few additional features and a tweak to the slightly clunky control mechanism prevented it from getting a higher rating. Remember in addition to rotate, you can also flip your tiles. This is hidden away in the menu button. AndroidGamesReview.com is out to find the Best Android Brain & Puzzle Games and the Best Free Android Games for you to play on your phone. Visit us regularly to see our reviews of the latest indie games for Samsung, HTC, Nexus and other Android phones. If you ever get stuck with a game, then feel free to leave us a message or check out our game hints and tips. You can install apps from Google Play by scanning the QR code or clicking on the image link in the review page.